The 35-year-old car and passenger ferry Al-Salaam Boccaccio 98 left the Saudi Arabrian port of Duba, bound for Safaga, Egypt, on a stormy night of February 3, 2006, her decks crowded with an estimated 1,312 passengers and about 104 crew members. Few of those passengers, mostly Egyptian workers on their way home from jobs in Saudi Arabia, knew that this ship was taking them into a fiery disaster that would rival the records of marine mishaps throughout the world. More than 1,000 people perished when the ship burned and sank just 62 miles from Duba. 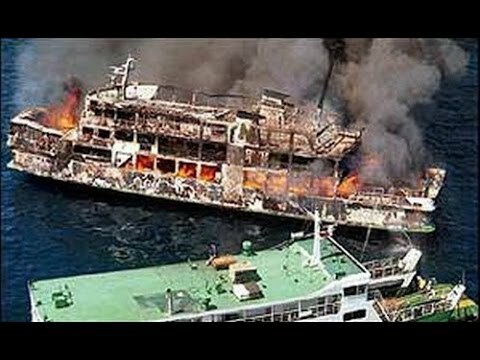 Survivors said a fire broke out below deck shortly after the ship left port and soon after that, the vessel began to list, but for some reason the crew continued on out to sea rather than turn back to Duba. Sha hata Ali, an Egyptian survivor, said the captain, identified as Sayyed Omar, told everyone not to worry. "We were wearing life jackets but they told us there was nothing wrong; told us to take them off and they took away the life jackets. Then the captain took a boat and left," he said. Other survivors supported Sha hata's story that the crew played down the seriousness of the problem and also withheld life jackets. "There was a fire but the crew stopped the people from putting on life jackets so that it wouldn't cause a panic," another man said. Said survivor Nader Gala I Abdel Shafi: "There was a blaze down below. The crew said 'Don't worry, we will put it out.' When things got really bad the crew just went off in the lifeboats and left us on board." A spokesman for the Egyptian Ministry of Transportation later said the fire apparently started in one of the more than 200 vehicles parked below deck. The crew thought they had put the fire out, but then it flared up again and got out of control. It was believed that in their efforts to battle the fire with water on the lower deck, the crew may have actually flooded the ship, contributing to the vessel's capsizing and sinking. Also the ship had been recently modified, with two passenger decks added to the superstructure, and it was thought that the high winds, buffeting the tall ship, also became a factor. ​Neither the Egyptian nor the Arabian Coast Guard reported receiving an S.O.S. from the stricken ferry, although another ship in the area reported receiving a radio transmission from the captain who said his vessel was in danger of sinking. An extensive search and rescue operation was launched the following morning after the Al-Salaam Boccaccio 98 failed to arrive in Safaga at its scheduled time. By then, some of the estimated 400 survivors were stumbling ashore on the Western coast of Saudi Arabia. Egyptian officials suggested during the investigation that followed that the ship failed to have enough lifeboats for the human cargo it was carrying. In Safaga, police used tear gas to disperse hundreds of rioters after they smashed windows at company offices and set fire to a large picture of one of the companies' ferries. Although he reportedly abandoned ship with crew members in one of the life boats, the captain could not be located after the disaster. Only one year earlier, another ferry owned by the same company, the Pride of al-Salam 95, sank after a collision with the cargo ship Jebal Ali. Two people died and another 40 were hurt. Al-Salaam Boccaccio 98 was built by Italcantieri, of Italy, in 1970. The 132-meter-long vessel was originally named Boccaccio and designed for Italian domestic service. Its original capacity was for 200 automobiles and 500 passengers. It was one of a fleet of six ferries built for that line. The vessel was purchased in 1999 by El Salam Maritime Tranport in Cairo after it was rebuilt. That modification, completed in 1991, increased its automobile capacity to 320 and its passenger capacity to 1,300. The ferry's nick name was simply Salam 98.